Our family ride at its destination Holmebrook Valley Park today. Thanks to the six riders who turned up. Our next ride will be in March - details to follow. Our next family ride will be on Saturday 14th January. 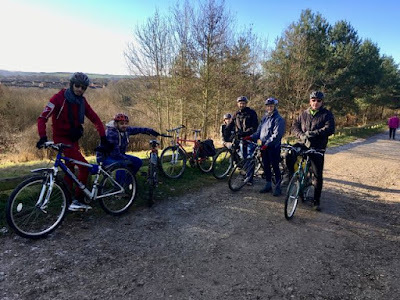 We will cycle up the Holmebrook Valley Trail to do a circuit of the lake at Holmebrook Valley Park and return. All welcome (whether with children or not!). There is a short on road section crossing Ashgate Road. Hope to see you there. Departing from Queen's Park north car park next to the old sports centre at 11.00am.